Hare Kṛṣṇa! What a wonderful combination is Baḍa-Hari Prabhu’s Kīrtana and being in the presence of the most ancient Deities of our six Gosvāmīs of Vṛndāvan! We are here at Rādhā–Vinodilal temple, they call Him Rādhā Vinod. We won’t talk about Rādhā–Vinod today, but just some of you maybe haven’t been here before; so for their information, these are the Deities of Lokanātha Gosvāmī. Lokanātha Gosvāmī was the beloved Spiritual Master of Śrīla Narottama Dāsa Ṭhākur. Although we don’t hear so much about Lokanātha Gosvāmī, it is just because he was such an incredibly humble soul that he didn’t want anything to be talked about him. But he is sometimes referred to as the Seventh Gosvāmī, because actually he and his very good friend Bhūgarbha–Gosvāmī were the first to go to Vṛndāvan. I better not get into that story, because that’s a long one. But just so you know that this Deity Rādhā–Vinod actually appeared to Lokanātha Gosvāmī as he was doing Bhajan in the forest of Vṛndāvan near a village named Umrāo. He was just sitting doing his meditation, and suddenly this Deity appeared to him. He had a desire for the Deity and this Rādhā–Vinod just appeared before him. There are two stories: One is that a little boy arrived holding the Deity and just placed it down and ran away, and the other is that the Deity just opened his eyes from his japa and he saw the Deity standing before him. Then Lokanātha looked around and wondered, “Who brought this Deity?” Then Rādhā–Vinodilal said to him, “I have brought Myself.” This Deity, if you see Him, is fairly small, so Lokanātha Gosvāmī made a bag, and he wore the Deity around his neck. So we won’t go into the details, but just so that you know where we are and who these Deities are, so I just wanted to bring that point up. I thought I would talk today a little bit about giving a broader picture on what Indradyumna Mahārāja spoke so wonderfully and explained to us regarding: “Who is Rādhā Govindajī and how He appeared. How He came; how He landed up in Jaipur?” But, on the altar, there are also other personalities; so to round out our understanding of Who’s all there at that temple, I would like to talk a little bit about Śrīmatī Rādhārāṇī and the Deities that were brought by Kāśīśvara Paṇḍita. Just to know little bit of the past of Kāśīśvara. He was a very powerful man physically. He used to always go in front of Caitanya Mahāprabhu and move away the crowds and keep everything peaceful, like some of the devotees are organized to do that here; keep everybody back, and that’s what Kāśīśvara Paṇḍita did. He was always there right next to Lord Caitanya. 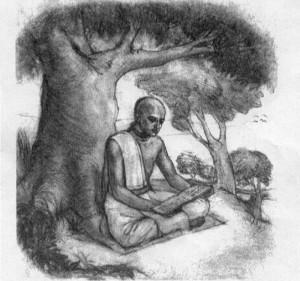 He was also the Prasādam server, the organizer serving Prasādam by Lord Caitanya’s order. Thus he had very important service there, and service that he must have loved so much. Now he is being sent away to Vṛndāvan to take care of Govindajī. But it is interesting to note, Lord Caitanya wanted to send His best man to take care of the Deities. We also, in our movement, should think in this line of Caitanya Mahāprabhu, that our best people, our most elevated people, should be caring for our Deities. Kāśīśvara Paṇḍita, he didn’t really like that idea, he was lamenting piteously. 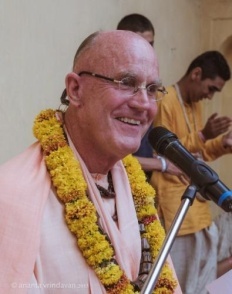 He just couldn’t bear the thought of leaving the service of Mahāprabhu—very difficult to ask. He actually said, “How can I leave You? How will I be able to maintain my life? 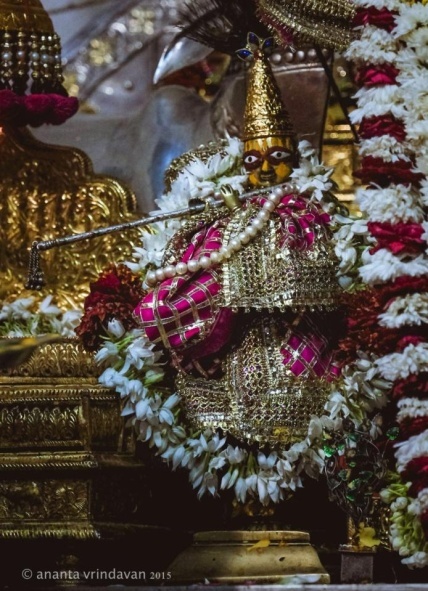 If I leave You, how would I live?—I would die!” Thus Lord Caitanya gave to Kāśīśvara Paṇḍita a very special Deity called Gaur–Govinda, which is Govinda and Gaur in one Deity. And He said, “I am going with you, and I am always going to be with you in the form of this Deity.” He gave him instruction: how to worship that Deity and He said, “Whenever you offer bhoga to Him, you will just see how I am eating.” So with great difficulty Kāśīśvara Paṇḍita had to leave the association of Mahāprabhu with his Gaur–Govinda Deity and travel to Vṛndāvan. He placed that Deity at the feet of Govinda–Deva and then for the rest of his life, he dedicated himself fully to the service of Govindajī and Gaur–Govinda. It’s important by the power of his love, for the first time, Mahāprabhu came to this side of India in the form of a Deity. You probably wouldn’t have noticed, but that Deity is there on the altar of the temple of Rādhā–Govinda. Puruṣottama–Jana still had a desire and wanted to send Rādhārāṇī to Govinda. He tried again many, many times to make a Deity, but somehow or another, it just didn’t happen, until he had a dream. Everything is based on dreams in those days, and Rādhārāṇī came to him and said, “I am in the Jagannātha Temple. Actually, the Deity that they are worshipping there as a Lakṣmī is actually Me, and I want to go to Vṛndāvan and be with Govindajī. I won’t be Lakṣmī anymore.” Puruṣottama–Jana woke up and he was very excited, and he rushed to the Jagannātha temple and went before this Lakṣmī–Devī and he saw, “Oh, this is Rādhārāṇī!” So then he inquired, trying to get to the root of this, “How did Rādhārāṇī become Lakṣmī–Devī here in the Jagannātha temple?” He found out that long, long ago She had been brought from Vṛndāvan to a place called Rādhānagar in Orissa. Now I don’t know—there is no history of who brought Her and why did he only bring Rādhārāṇī. But somehow or other, that place Rādhānagar became named Rādhānagar after Rādhārāṇī came. But somehow, She actually originally came from Vṛndāvan to this place in Orissa. There was a very, very pure devotee there in Rādhānagar whose name was Bṛhadbhānu. He was a very, very pure devotee, very rare soul, and he worshiped this Rādhārāṇī Deity like his daughter. So a very, very highly elevated devotee. He worshiped Her in a mood that if he didn’t have a sight of Her even for a few minutes, he would be in an unbearable separation. So that’s the kind of devotee he was. He was famous for his love for Śrīmatī Rādhārāṇī. When he expired, even the king wondered, “What are we going to do now with this Rādhārāṇī Deity? 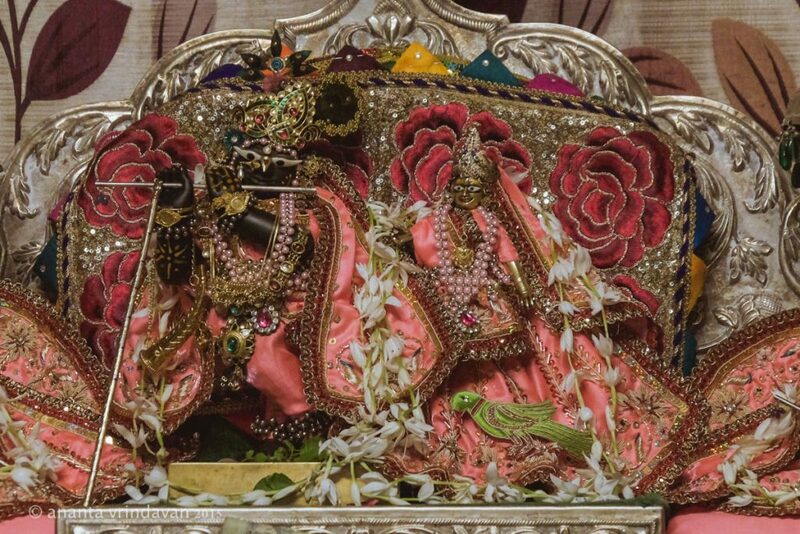 This great soul has gone, now there is this Rādhārāṇī Deity.” The king himself at that time went to Rādhānagar and got this Rādhārāṇī Deity. Now we are talking about the Deity that’s on the altar there that we are going to see every day. He went to see this Deity of Rādhārāṇī and he was trying to figure out, “What we should do now? What should we do with Her?” While he was there he had a dream and Śrīmatī Rādhārāṇī appeared to him. Apparently, She likes to appear in dreams to people. We haven’t had that good fortune, but it’s something we can look forward to, maybe in some lifetime. Thus, Śrīmatī Rādhārāṇī said, “Take Me to the Jagannātha Temple.” He was very happy to follow those instructions and He brought Śrīmatī Rādhārāṇī to the Jagannātha Temple. But over the course of time, many, many years, people started to just see Her as Lakṣmī. Somehow the history got lost and people started worshiping Her as Lakṣmī–Devī and She reciprocated according to their devotion. Puruṣottama–Jana was very, very happy to find out that this is the Rādhārāṇī that should go to Vṛndāvan and that should be with Govindajī. So She was brought to Vṛndāvan all the way across the country in a great procession, and all the devotees in Vṛndāvan received Her with great ecstasy. Then we know, as Mahārāja described the history from thereon out, that Rādhā and Govinda were united in Vṛndāvan, and then eventually, the disciple of Raghunātha–Bhaṭṭa, Māna–Singh built a glorious temple for them, the best temple in Vṛndāvan. As Mahārāja described, the Deities were in Vṛndāvan until the nasty Aurangzeb started to attack temples, and then the Deities were brought here. Really, I think we can feel how wonderful it is to be in Jaipur, where so many of the principal Deities of Vṛndāvan are situated. It’s just so powerful to be in Their presence and to be in these temples and have these beautiful Kīrtanas in such a historical place. We tell these stories not just to entertain or just to tell a story, but so that we understand our heritage and how amazing is the history and how glorious is what we have entered into. It becomes so much more meaningful when we go to the temple of Rādhā–Govindajī, and then we see, “Oh there is Gaur–Govinda, the Deity that Lord Caitanya Himself gave that came all the way.” It becomes very meaningful. We don’t just look at the altar with a blank look. You know, we experience, “Wow, this is very interesting, exciting, amazing!” It was a very glorious time when they started to build the beautiful temple for Rādhā–Govinda here, and it was a very glorious time for Gauḍīya Vaiṣṇavas. All these Deities were now nicely protected. But as usual, when there is some kind of success, some pushing forward, there is also pushing back by the material energy there, and challenges, and things which come after that. Not everyone was completely in ecstasy about Govindajī’s arrival here in Jaipur. As with anything, there is always somebody who is unhappy about things. What was going on here at that time for many generations was that Rāmānandī Vaiṣṇavas had been very prominent. They were favored very much by the queen. I believe they were worshipers of Sītā–Rāma, so that was the primary Deity at that time. The queen, she loves Sītā–Rāma and she loves all these Rāmānandīs, and then all of sudden this Govindajī appeared. As with every situation, there is always a political side, a power issue. There are many factors to everything apart from just devotion. The Rāmānandī’s saw, “Wow, Jai-Singh, the King, he has so much attraction, affection and attachment to this Govindajī Deity. What is going to happen to us?” There is always a power and a prestige issue and financial backing and so many things that these Rāmānandīs had been given for generations because of the favor of the queen. But now the king had such a strong affiliation with Vṛndāvan and with the Deities of Vṛndāvan. For Jai-Singh, this arrival of Govindajī was a major turning point personally in his spiritual life. Unfortunately, many of the spiritualists are not always the true spiritualists which they should be. So those Rāmānandī Vaiṣṇavas, they were quite upset that, “Now the King’s attention and affection and now, probably, finances, and so many other things are going in the direction of Rādhā–Govinda.” They waged war against Gauḍīya Vaiṣṇavas basically and it was a very difficult time. 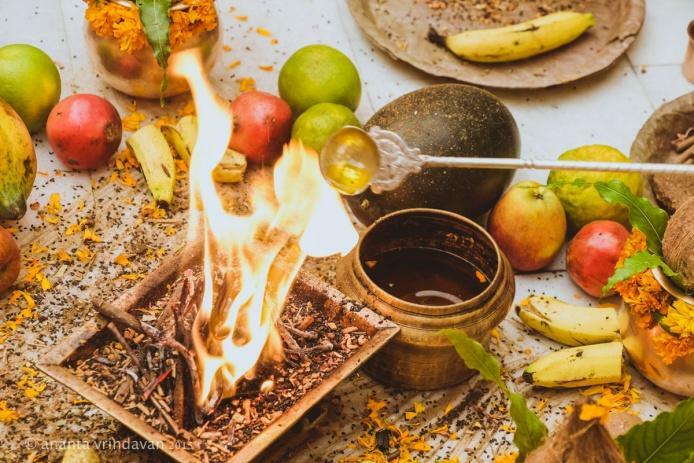 Now to give you a little background to the story that will develop, we’ll have to tell a little bit about the history of an extraordinary devotee who saved the name of Gauḍīya Vaiṣṇavism here in Jaipur, and that devotee is called Baladeva Vidyābhūṣaṇa. We don’t even really know what his original name was. Vidyābhūshaṇa was the name given to him later, an honorary title. Not much is known about his lineage, because again, like Lokanātha Gosvāmī, he is a pure devotee and therefore devoid of false prestige. So he just never talked about himself. We don’t know much about it, but we know that, although he came from a merchant family, he had no inclination for that particular cast. He was born in Orissa, in a town near Remuṇā. From a young age, he had the desire that he wanted to be a teacher. He didn’t want to be a shop-owner. Those days actually it was very, very common that whatever family you were brought into, you just do what your dad did, and it just goes on like that for generations. But he didn’t have any inclination. He wanted very strongly from a very early age to be a teacher of divine wisdom. That means he had to study extra, extra hard, because he wanted to break out of his normal cast to do something that wasn’t really expected of him. He became a very, very learned young boy. He studied cosmology, logic and medicine, all kinds of topics he became expert in. When Baladeva arrived in Vṛndāvan to take shelter of Viśvanāth Cakravārtī, a lot of the glory of Vṛndāvan had already been diminished. As Mahārāja described yesterday, how there were all the Mughal attacks, and Vṛndāvan was in incredible turmoil for a long time. He started studying under Viśvanāth Cakravārtī, and during this time, now Govindajī had arrived here in Jaipur, and the Rāmānandīs were beginning to wage their war on Gauḍīya Vaiṣṇavas. The first attack of the Rāmānandīs was to question the legitimacy of the Gauḍīya Vaiṣṇava line. They are saying, “There are only four Sampradāyas, so who are these Gauḍīyas? Where have they come from? They are not in those Sampradāyas.” They made this challenge, and, of course, the king, although he favored Govindajī and the Gauḍīyas, he has to be fair as a King. He had to show that this is legitimate. Apparently at that time to be legitimate you have to have a commentary on the Vedānta-Sūtra. You have to show what you are doing is in line with tradition. Jai-Singh was very concerned about this, but he had to deal, he had to be fair as he is the king. He wrote to Mahānts in Vṛndāvan, and he said, “Look, you have to help me. I don’t know what to tell them about, “How are you legitimate? How is your Sampradāya?” How are you going to explain this? Of course, our Gauḍīya Vaiṣṇavism begins with Mahāprabhu, and Mahāprabhu who is He? He is God Himself, so how much more legitimate can it be? God Himself is the head of our Gauḍīya Vaiṣṇavism. The Rāmānandīs were saying, “No way, we will not accept that argument. We want to see your commentary on the Vedānta-Sūtra.” Then, the answer to that was that, “The Śrīmad Bhāgavatam is the natural commentary on Vedānta-Sūtra.” That’s the way we accept it. There is no need for a commentary on Vedānta-Sūtra, that’s Bhāgavatam. This was pretty serious, can you imagine your Deity, Rādhā–Govindajī, and now you’re going to take away Rādhārāṇī, who traveled all the way from Orissa, went to Vṛndāvan, and then came here. Now, they are threatening that, “You have to take this Rādhārāṇī off the altar here because this is bogus.” So this is very serious. All the four temples in Vṛndāvan, major temples there, the Mahānts got together. They wrote something about how both Parakīya and Svakiya Bhāva, married love and unmarried love, how Deities can be worshiped in both ways. Then again, the Rāmānandīs, “No, no, we don’t accept his arguments.” Now apparently Jai-Singh actually did remove Rādhārāṇī from the altar for some period of time. Now just picture that, just picture going in to see Rādhe Shyam in Vṛndāvan and Rādhārāṇī is not there. I mean, how horrifying? How shocking? Then the Rāmānandīs become even more forceful. They said, “But why are you not worshiping Nārāyaṇa first?” Apparently that’s the tradition in some lines. It was getting very, very difficult and very worrisome for, what was going to be the future of the Gauḍīya Vaiṣṇava line? I mean, we wouldn’t be here if somehow they didn’t keep the Gauḍīya line going strong and prove its authenticity. Someone had to do that. It became an actually desperate situation where Viśvanāth Cakravārtī was keeping in touch with all of this fighting that’s going on in Jaipur and thinking that, “I have to do something as the leader of the Gauḍīya Vaiṣṇavas at the time.” Baladeva Vidyābhūshaṇa had been studying under Viśvanāth Cakravārtī, and he was an incredibly knowledgeable person who was expert at debate. If you remember, he was trained under Madhvācārya’s group, so he was very well versed in all arguments. Viśvanāth Cakravārtī Ṭhākur sent his student Baladeva Vidyābhūshaṇa here, to Amber, to defend the name of Gauḍīya Vaiṣṇavas. At that time, the center was in Amber; the Jaipur city had not been built yet. Baladeva Vidyābhūshaṇa arrived as a young devotee that nobody knew. He wasn’t famous. He was a very young man and unknown to everyone here, but in him was a philosophical giant. Because he was unknown, it was even difficult to get an audience with the king. But eventually he did see the king and he said that, “I am here to defend the Gauḍīya Vaiṣṇavas.” So they accepted. He made the challenge, “Here I am going to do it. I am going to explain you why we are legitimate.” He said, “I have come to resolve this issue.” The Rāmānandīs were kind of thinking, “Who is this new kid on the block?” But since he was making the claim, they said, “Okay, you go ahead, but we don’t want to hear what you want to say. We don’t care what you have to say. We just want to see your commentary on Vedānta-Sūtra and nothing else will be satisfactory.” Just as a side note, formerly during the time of Śrī Caitanya Mahāprabhu; well actually, when Jīva Gosvāmī was going on Parikramā with Lord Nityānanda, Jīva Gosvāmī had the idea to write a commentary on Vedānta-Sūtra at that time, and Lord Nityānanda told him that, “There is no need to write this commentary now, later on Gopīnātha Ācārya is going to take birth, and he will write that commentary.” So it was many, many years later, and it was Baladeva Vidyābhūṣaṇa who was the reincarnation of Gopīnātha Ācārya. Then Baladeva Vidyābhūṣaṇa had a dream, and in that dream, Govindajī Himself said, “You write this, and I will move your pen. I will compose it, and no one will be able to defeat you.” Next day, Baladeva Vidyābhūṣaṇa woke up as a very happy man. He began to write with great, great enthusiasm and happiness. Some say it took non-stop for seven days, and some say it took a month. But however long it took, it was a miraculous task. What he wrote, became known as “Śrī Govinda-Bhāṣya”—the words of Govinda. He came before everyone much to the shock of the Paṇḍitas and the nobles. Everyone came together and that’s how they resolved issues in cultured society. There are no nasty emails flying back and forth: “No, I think this. No. I think that.” They get the smartest people together that are the Paṇḍitas, the devotees, the nobles, the Kings. And they have an open mind. They wanted to hear the arguments; they don’t want to fight. They just wanted to hear—what’s right? Baladeva Vidyābhūṣaṇa came before this large gathering of people, royal people and all the Paṇḍitas. He spoke so eloquently and so exhaustively on each one of the points. He made it very, very clear each argument that had been set forward. He made it very, very clear to explain our Gauḍīya Siddhānta. Jai-Singh was so happy that he built a temple of victory. I think it’s at Galtaji. We went there last year. That’s where the debate took place. He then installed the Deity called Vijaya Gopāla, so such a glorious victory. Just to bring it down to our practical level of how this applies to us: We can know that there is always going to be challenge. Fortunately, there was an amazing devotee who was able to uphold the name and the legitimacy of Gauḍīya Vaiṣṇavism at that time. But it’s not like, ‘’Oh, okay! Well, he did the job and now it’s all over.” There is always going to be more challenges that come our way in the course of devotional service. Devotees have to be prepared to defend who we are, what we are, what we stand for, how it’s right, how it’s bonafide.” Because these kinds of things happened in the past, and they are happening now and will happen in the future—where we are really having to be able to explain, how we are legitimate. As I was talking the other day about Narottama Dāsa Ṭhākur, that he had made a strategy of how to do his preaching, and so he had called everyone together and had that incredible festival called Kheturī Mahotsava. It was so successful, and his name spread far and wide, and he really uplifted the whole of Gauḍīya Vaiṣṇavism at that time. But there is always somebody that’s going to challenge. Narottama Dāsa Ṭhākur was challenged in similar ways to what happened in Jaipur. Because after the Kheturī festival Narottama made so many disciples, who were very elevated Brāhmaṇas, Paṇḍitas—very influential people. Just like the Rāmānandīs here became concerned, so in the same way, many Paṇḍitas in the area where Narottama was preaching also got concerned, “Oh, he is getting so powerful, this Narottama.” They made a challenge, because Narottama was also initiating people who were non-brāhmaṇas, and this was very controversial at that time. A whole band of Paṇḍitas decided to come and have debate with Narottama, “What you are doing is not right. This is not bonafide.” Narottama Dāsa Ṭhākur, he really didn’t like debates. He didn’t really like to argue with anyone. His disciples knew that, so they made a plan that they would hand off these Paṇḍitas before they arrived to argue with Narottama. That’s a whole story. I won’t tell all of that, but just briefly, Gaṅgā–Nārāyaṇa Cakravārtī and Rāmacandra Kavirāj, they dressed themselves up as pot sellers: clay-pot seller and a pan-vala. 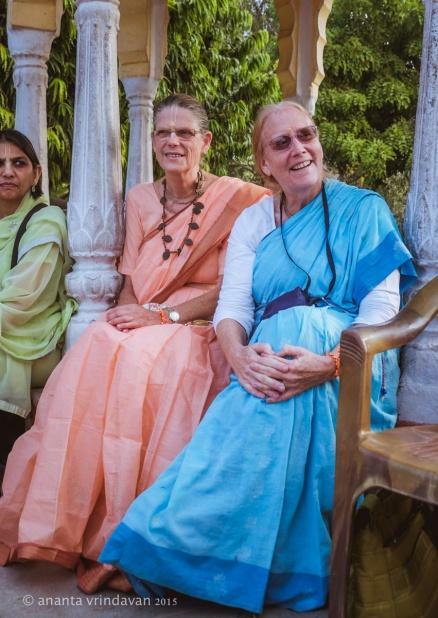 They dressed, sitting at their shops, and then these Paṇḍitas came in to buy their bhoga and things for the Pūjā, and stuff, and they hear these two shop-valas speaking in eloquent fluent Sanskrit, like “Wow!” The Paṇḍitas were completely shocked, “What kind of town is this? If even the shop-valas speak eloquent Sanskrit, then what are the Paṇḍitas here?” They got a little nervous. The Paṇḍitas were like, “Wow, we are going to debate with Narottama Dāsa Ṭhākur, but we can’t even defeat his disciples, we better get out of here. Forget it.” This ability to defend your spiritual position and to have this strength to be able to do that is required. That’s going to be required for everybody in some small way or maybe in some very big way. Already in our movement we have got so many situations where devotees have to figure out how to defend our position. Like when I first joined, I came to the temple to live in a temple after Janmāṣṭamī in 1970 in Detroit. I think that, probably at that time, was one of the first major difficulties that happened in the movement. I didn’t know what was really going on. I was just a plain new devotee. But all the devotees just came back from the Janmāṣṭamī festival in New Vṛndāvan and there, four senior Sannyāsīs had been propagating an inappropriate philosophy. In a nut-shell they were saying Guru is God. Many devotees that were there at the festival were really in anxiety, because they knew that what they were saying was wrong, but they didn’t know how to defeat it. So it was a real major problem. The devotees were so disturbed by what they were hearing. They knew that, “That doesn’t sound right. That’s not our philosophy.” But they didn’t have the Śāstric reference, and they didn’t have the maturity to really defeat them. So I remember that all went to Prabhupāda and eventually everything got resolved. But as a result of that, we all realized that, “We just don’t know enough. We should have been able to say these things.” Thus, we did as a radical thing as, “We have got to study whole lot more.” We decided we have got to study the whole day long one day., But when you are going to do Sankirtana?—For the whole next day. It’s like a 48 hour schedule, so we can cram everything in. We made a schedule where we had Bhagavad-Gītā, Śrī Īśopaniṣad and Nectar of Devotion and then an all-day schedule of classes. Because we realized we weren’t capable, we were not able to rise to the challenge. So we needed to learn more. As you can imagine, devotees sitting for 6 or 7 hours a day studying, and then everyone was in sound sleep within two hours. When it came to Śrīla Prabhupāda, he nixed it immediately, “This is not necessary, Śrīmat Bhāgavatam in the morning, Bhagavad-Gītā in the evening. Chant Hare Kṛṣṇa and go on Sankirtana. Don’t be fanatics!” Then there are other things we had, a Gopī Bhāva club thing that we had to deal with. So many things, and if you don’t know the philosophy of Kṛṣṇa Consciousness, you are just sentimental, how to deal with it? You don’t know, “Oh, God, what are we going to do?” We had huge problems with brainwashing things at some point, so there are always problems that you have to come forward, to be able to defend our tradition. Even after Prabhupāda left, we still now got on-going with the problems like Ṛtvik ideas, origin of Jīva issues, so many things. They are always going to be there. We have to become knowledgeable and devoted to keep Gauḍīya Vaiṣṇavism alive, in the mood of Śrīla Prabhupāda who said, “I will fight till my last breath. I will preach, preach and preach,” which he did. Just going back to Baladeva Vidyābhūṣaṇa, maybe you have noticed that Śrīla Prabhupāda dedicated the Bhagavad-Gītā to him. I always wondered why. Because I never knew much about Baladeva Vidyābhūṣaṇa, I wondered, “Why did he dedicat it to him?” But now when you hear the story, you can get it. Just imagine, Baladeva uplifted the whole of Gauḍīya Vaiṣṇavism, he kept Rādhā and Govinda together—amazing; of course, Śrīla Prabhupāda dedicated it to Baladeva Vidyābhūṣaṇa. After that, Baladeva Vidyābhūṣaṇa returned to Vṛndāvan, and he became like a ruling Mahānta in Vṛndāvan after Viśvanāth Cakravārtī Ṭhākur. He is like a warrior, like a great hero coming back from battle. I mean, you imagine devotes were applauding like, “Yeah!” when he returned to Vṛndāvan. He became the Mahānta of the Rādhā Śyāma Sundara temple. He did his Bhajan there; you can see his cave. There is a little cave when you go down in the temple courtyard where he did Bhajan and lived there for 25 years or so. He wrote many, many more commentaries, and actually he brought a special stone from Orissa to have the Rādhā Śyāma Sundara Deities carved there. What an amazing personality! 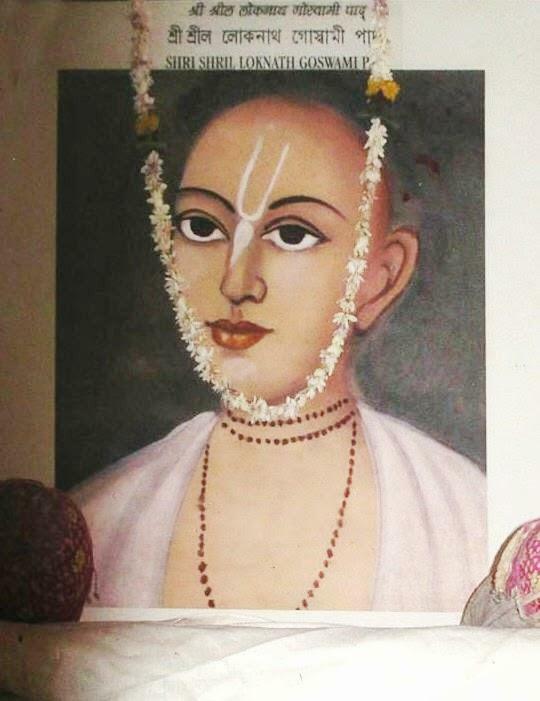 He was Gopīnātha Ācārya, the brother-in-law of Sārvabhauma Bhaṭṭācārya in a previous life, and in Vrajalīlā he was Ratnāvalī Devi—so what a personality! With that, I hope we have more appreciation of Who is there on the altar at Rādhā Govindadevajī Temple. “Who are those Deities or personalities? How They came to be there? Then, how we have came to be here?” These are all miracles, and we are just part of all these miracles that are happening. By the grace of Śrīla Prabhupāda, all this is possible to us. Jaya! Śrīla Prabhupāda ki –jaya!